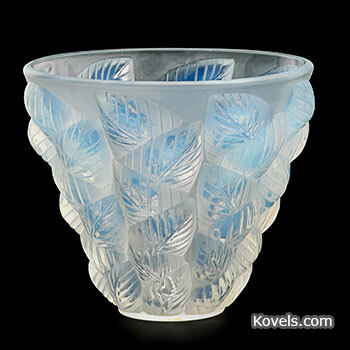 The distinctive markings on each piece of Lalique glassware help to date the pieces and makes them more collectible. The botanical Art Nouveau pieces sell particularly well, such as this 1927 opalescent Mossaic vase with leaves in relief. See photos and prices of vases and more.